How do they laugh in Africa? Wanting to do something useful for the people of developing countries we chose to focus on Africa both because we had the recorded experience of Simone Canova and his group in Burkina Faso, and because we had always been interested in Africa due to various vicissitudes. In particular I wrote a book with Laura Malucelli: Schiave ribelli (Rebel Slaves) that tells the story of the resistance against supporters of slavery and the slave revolts in America. In addition, we have been running a study-group for a year now on the fights of the slaves in Brazil, incredible stories of which little is known, where tens of thousands of slaves manage to rout the Portuguese armies, they have been resisting in Benares for almost a century, defending a large territory and a town. But unlike what happens to other slave rebellions, eventually the Brazilian blacks are not exterminated. When they understand that they cannot resist any longer against the new European guns, they flee into the Amazon rainforest in which they literally disappear for two and a half centuries. Then they are “discovered” in the 50s by some anthropologists, still ready to fight because unaware of the end of slavery. We still needed to decide what kind of project to attempt to achieve. Considering our abilities and experiences that are especially related to all forms of communication and entertainment , we decided that it was appropriate to focus our work on two concurrent issues. On the one hand we could be useful by gathering and diffusing information about methods tried out in the field of eco-technology by solidarity organizations. Via the New Committee Nobel for the Disabled Non-Profit Organization we consequently financed a workgroup that produced the book Ecotecnologie (a basso costo) per tutto il mondo (Eco-technologies (at low-cost) for the whole world) text that we are distributing for free to hundreds of non-profit organization and that we are translating into various languages (continuously extending it thanks to the indications we receive from many people). On the other hand we decided to create a theater experiment of information with the aim of spreading some eco-technological solutions in the villages. Obviously we immediately dropped the idea of being the ones to decide what to tell and of writing and performing the plays. It would not have made any sense. We do not have enough experience to decide which messages to propose, we do not know what stories may fascinate and involve, there is a large cultural gap that would invalidate any attempt in this direction, not to mention the language barrier: dialects are spoken in the most remote villages and in the best case swahili, a widespread Bantu language. So we decided to put our experience at the service of local theater groups. The first question we asked ourselves was: are there any theater groups in the most remote villages and do their narrative canons have any contact points with ours? The second question was: how do they laugh in Africa? The first pieces of information on the subject were quite discouraging. We found videos and stories about many theater experiences, a means that is widely spread. But these are mainly educational shows, on canons of the Theater of the Oppressed. A very effective form of communication, based on dramatizations of emblematic situations. The actors, often in the streets, perform discussions and disagreements between husband and wife or between teachers and students, and they involve the public in the drama by asking people to take the place of the actors or suggest the development of the situations. Exceptional experiences in many aspects but far from what we are good at, the Art Theater works on other communication patterns, it needs narrative devices, humorous situations that lead typical scenarios to the extreme building parables and playing with reversals and amazement. But investigating further, we found that even in Africa (as it had been assumed) there was a great tradition of comedy, rooted in the festivities of the most remote villages, where traditions resisted untainted. At weddings and other celebrations, comedy was always present and there was even a figure that was very similar to our Harlequin. So there was something to get our teeth into. Decisions being made in general terms, there remained the problem of how and where to build up this experience from a practical point of view. We started to use the tam-tam of the network, to ask friends and readers of our sites, to spread the word and then, as it often happens when you manage to imagine a good project, a series of random events led us to Doctors with Africa CUAMM (Medici con l’Africa CUAMM) and Eni Foundation that works with this non-profit organization and finances it. We asked for a meeting with Filippo Uberti and Stefano Cianca of Eni Foundation, described our project and saw that there was interest and willingness to support the cost of this enterprise. 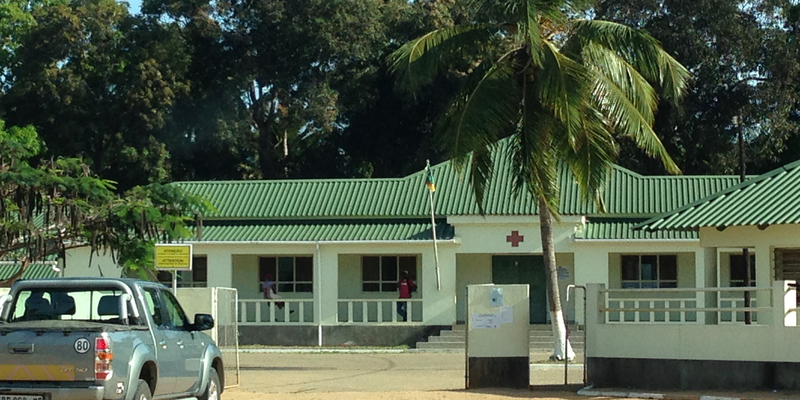 In particular in Mozambique, Eni Foundation and CUAMM run a health center in the area of Palma. This is an area where about 50 thousand people live in small villages of huts and face great difficulties every day. CUAMM offers free health services and medicine, runs two operating theaters with modern equipment and a house used by women who are about to give birth. The doctors and the staff of CUAMM Eni Foundation explained to us that it would be very useful to help spread the culture of preventive health care. When we realized that that meant working in the north of Mozambique, it seemed like an auspicious coincidence. In the historical research that we carried out we often dealt with peoples that live right in that region, where the majority belong to the Makua ethnic group, a people of San descent. The same of which we wrote about when dealing with the resistance to the slave hunters and with black riots in Brazil (Mozambique was a Portuguese colony). Then we find out that a black harlequin is known even among the Makua, mask through which the actors of the villages play with stereotypes, inventing characters and hilarious and symbolic situations. This coincidence of the presence of the San ethnic group in the area where we had been suggested to work was just the beginning of a series of amusing cases. For example, when we first wrote on Facebook that we were looking for a Portuguese interpreter, Stefano, who worked two meters away from him, replied (also via FB) “Look, Isaac ‘s girlfriend speaks Portuguese.” And Isaac lives in Camperi, a few hundred meters from Simone’s house, four kilometers from Alcatraz! We invite Johara to lunch and find that she lived in Mozambique for years. Incredible! And when we say that we have to organize an expedition to Palma she says, “Palma! Fantastic! My brother lives in Palma. ” Well, there are all the auspicious coincidences. Now we get to work.